Many people choose Overhead Door when they think of installing and maintain garage doors for their homes. However, many businesses require various types of overhead doors, as well. We’re here to tell you all about our rolling service door options. 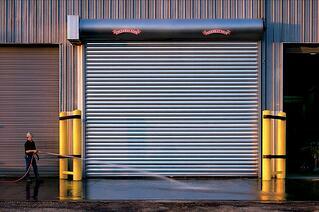 Overhead Door offers a rolling service door product line that is tough to beat. We work with you to make sure that your project specs and style are met easily. Rolling service doors are perfect for businesses with space limitations, where side room and headroom is at a premium. A simple, understated rolling door might be just what you’re looking for. Perhaps you want something a bit more high tech. Either way, we offer a variety of upward-coiling service doors to meet your needs. Our rolling doors are capable of fitting openings up to 1500 sq. ft. (139,355 sq.mm). They also come in the industry's widest array of curtain materials and colors, and slat profiles. These options help you to design exactly what you need for your business. These choices offer our customers a practically limitless array of individualization to make your rolling service doors both visually appealing and functional for your business. Primed or painted steel, clear, or colored anodized aluminum, or PowerGuard finish options. Color options include approximately 215 colors. Push-up, chain-hoist, crank, or motor operation available. Insulated slated and/or weatherstripping options. Stormtite™ models provide the most advanced thermal performance values published by any major U.S. manufacturer of insulated rolling steel doors. Need more details about customized rolling service doors? Be sure to visit with us. 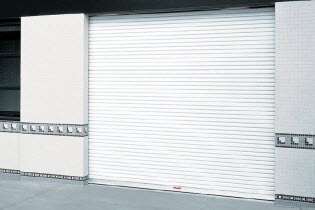 If you’re interested in inquiring about our rolling door options for your business, choose Overhead Door.